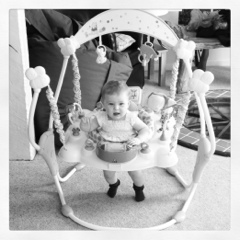 The jumperoo has finally been hoisted up to its maximum height. Signalling the end of my daughter’s babyhood. And her ascent to toddlerdome. And the realisation that I won’t be able to rely on it as the sole entertainment source any longer. And the end of my life. Balls. We loved the Jumparoo. Both girls had huge fun in it. It was the last 'baby toy' we sold on eBay and it felt kind of sad doing it. It gave me peace and quiet and time to eat meals on my own now and again. I wholeheartedly agree with your thoughts. Indeed – it is the ultimate baby toy 🙂 just as good for mummies as babies! 7 months…You've got loads of time left yet. I kept mine in it until they could walk (not constantly obviously 🙂 ) at 13 and 16 months!